Sometimes while editing pom.xml one needs to define a property and replace the occurrences of some value – artifact version, for example, – with this property. Now you can use the new IDEA Introduce Property refactoring for these purposes. Refactoring finds all the occurrences of the selected string in the poms hierarchy and replaces them. More refactorings will be added soon. This entry was posted in New Features and tagged ideaX, Maven, Refactoring. Bookmark the permalink. Great news. I’m pretty sure I’ve assumed this would work in the past and been disappointed. Looking forward to this and future maven refactorings. When you say “now”, is that 9.0.2? Just one thing: global string search&replace should be optional, same as the code refactoring dialogs. I’m assuming it will be in the next EAP, as it doesn’t work in current EAP v95.54! This feature is not available in 9.0.2, it is in IDEA 10 branch only. Tomer: when search&replace is performed, you can observe the occurrences and process or skip them. 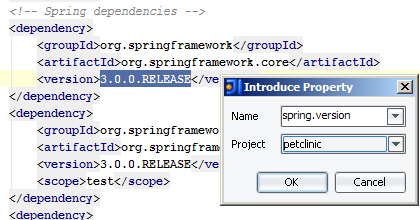 Also, if you select the current pom as a project, refactoring looks for occurrences in the current file only. Is this refactorings work in all the child poms as well (poms which inherits the changed one)? Is this available in 9.0.2? yes, refactoring processes the child poms. Is there an EAP for 10 out yet? I really appreciate what the IntelliJ team is doing – by letting us know of what is to come. This feature is indeed a nice addition. But, please always keep an eye on performance issues. I’d rather speed along coding without this feature than having to wait for 3 to 5 minutes at a time when I refactor the poms. This is a great start. May I suggest another maven refactoring feature? dependencies) from a child pom to a parent pom would be very helpful.